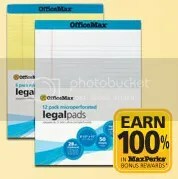 Office Max is offering another “free after MaxPerks Rewards” deal for MaxPerks Members (for businesses and teachers) to get a really sweet deal on legal pads, folders, and binders this week (ends Saturday, March 6). You can make your purchase in-store or online because shipping is free for orders over $50. This is a great deal if you can use these office supplies – they are “free after rebate” if you use your MaxPerks Rewards to purchase something you’d normally be buying. Thanks goes to Pocket Your Dollars for the heads up! You have to be a member in order to get the bonus rewards. Make sure your MaxPerks Member Number is associated with your account before you check out. 2. Buy the “Free after MaxPerks Bonus Rewards” products you can use. This is only a great deal if you already have the money to spend on office supplies and have a use for these supplies. You also need to know that you’ll use those MaxPerks Bonus Rewards to buy office supplies that you need in the future. Remember that it takes awhile to get those bonus rewards available to use in your account, it’s not an immediate credit. You should get an email when your MaxPerks Rewards are issued and then you can use them online or print and take them to the store to use.